Turns out the Church is still alive and kicking. The Presbyterian Church in Ireland spoke out strongly today to encourage local NI politicians to get their act together and make the executive work. And it even showed signs of having thought through the implications of dealing with the past and these infernal inquiries that loom ahead. I had heard some discussion that indicated Westminster should bear the full cost of these... but to do so would only strengthen the political incentive for them to proliferate. If the NI government has to bear the cost, perhaps pressure can be brought to bear to restrain these claims, in order to have some cash left to make the place work - by spending money on education, health, water, sewage, roads, for example. Maybe even on a devolved and cross-community police and justice system that actually works. It's a gamble, but it's in our interest - ALL of us - to make it work... isn't it? 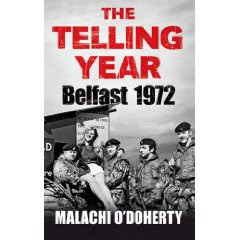 Having just read Malachi O'Doherty's The Telling Year, Belfast 1972, I'm absolutely sure we don't want to go back to the kind of fireworks that spooked my whole childhood here. It's haunting enough just reading it now. For Littlun's sake, let's not go back there. Credit Crunch - Curse or Blessing?